When Ruben Amaro sat in the visitor’s dugout at Nationals Park and explained why he did not trade a single player, it was hard not to laugh and think, “you screwed me again, Constanza.” It was just another low point in a horrific six years with Ruben Amaro. Amaro is no doubt receiving the ire of an entire fan base. Fans expect change with old, expensive, losing teams, but the same team that was 14 games under .500 before the trading deadline was the same team to hit the field after the deadline. Amaro’s inactivity on July 31 will be looked upon by most as one of his biggest failures as Phillies’ general manager. I am here to tell you July 31, 2014 was not the failure. The failure occurred on numerous preceding dates. July concluded with the date all Phillies fans had been waiting for. July 31st, the trading deadline. The trading deadline came and went without a single trade, leaving fans with the same wretched team and the same wretched roster. The month itself was equally as disappointing. 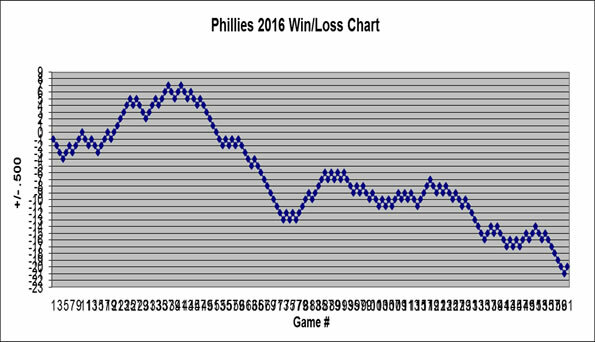 The Phillies began July 10 games under .500 and finished 13 games below .500. Phils Baseball is excited to provide a guest post from Rob Harrand, former Professional pitcher with the Phillies and co-founder of Reality Pitching. You can learn more about Rob and Reality Pitching following the post. players who exemplified this, and in turn, stood out from the pack. As a kid, I had a friend with a paper route who followed the classic hand-to-mouth business plan. While most "paper routers" collected money on a certain day of the month, he only collected whenever he wanted money for something like baseball cards or candy, oftentimes approaching whichever house was the closest. "First and foremost, I am going to make sure that everybody in my organization understands that our number one goal is to win that night's game, and that we will never shortchange the present in order to build for the future. Because 71 wins is better than 70 wins, and 72 wins is better than 71 wins. I do not believe in lost causes and sunk costs." We will never shortchange the present in order to build for the future. So, let me correct myself, the Phillies have a plan, but it is a stupendously flawed one. Plan, no plan, paperboy plan, whatever you want to call it, this line of thinking has leaked into the managerial office. Case in point: Darin Ruf. A couple weeks ago, I documented Ruben Amaro's good moves and his bad moves as general manager of the Phillies. Today, let's take a look at the rest of the moves which would not be considered particularly good or bad. As with the previous lists, this includes all moves of any significance, so pretty much everything involving the big club in any way was included. The average length of a Major League Baseball game is 3 hours and 8 minutes. Digest that one for a moment. Baseball games are a full 20 minutes longer than the 2:48 average 10 years ago. And if that doesn't get your attention, how about this number? It takes an average of 23.0 seconds between pitches in 2014, which is 1.6 seconds higher than it was just five years ago. Pace of games has the attention of Rob Manfred, baseball's next commissioner, who identified it as priority number one when he assumes the office in January. Why is Jonathan Papelbon still in a Phillies uniform? Jonathan Papelbon has been one of the best closers in baseball. His velocity and strikeouts are both way down, but dude continues recording outs and saves. He has a sparkling 1.49 ERA, has converted 31 of 34 saves, and has not allowed a run in 13 consecutive appearances. Papelbon cleared waivers, allowing Ruben Amaro to trade him to any team as long as he waives his no-trade clause. Pappy made it crystal clear he will accept a trade to a contender. So why is he still here? David Montgomery was asked prior to the 2009 trade deadline whether he endorsed going "all-in" to win a second straight World Series in favor of a more conservative approach. His response, and I'm paraphrasing since I cannot find the direct quote, was that he would prefer to contend each season and not win a title if the alternative is winning one World Series and falling off a cliff. Since those comments, the Phillies traded for Cliff Lee, Roy Halladay, Roy Oswalt, and Hunter Pence; surprised everyone by signing Cliff Lee; and handed Jonathan Papelbon the richest contract ever for a closer. They also re-signed nearly every core player, creating an historically old roster. Then, after an 89-loss season which cost the winningest manager in Phillies history his job, the Phillies refused to rebuild. Instead, they added 36-year-old Marlon Byrd and 37-year-old AJ Burnett, bringing their payroll to record levels with the same level of failure. Ruben Amaro did not make these moves in isolation. He needed ownership approval for all deals and it is quite possible the decisions to retain Rollins, Utley, Howard, and Ruiz were in fact initiated by the owners. Amaro may have been the man pulling the trigger, but it was the ownership loading the shotgun. Such an unprecedented level of incompetence from top to bottom is almost inconceivable. That is why it seems so clear now that the Phillies are preparing for the sale of the franchise.